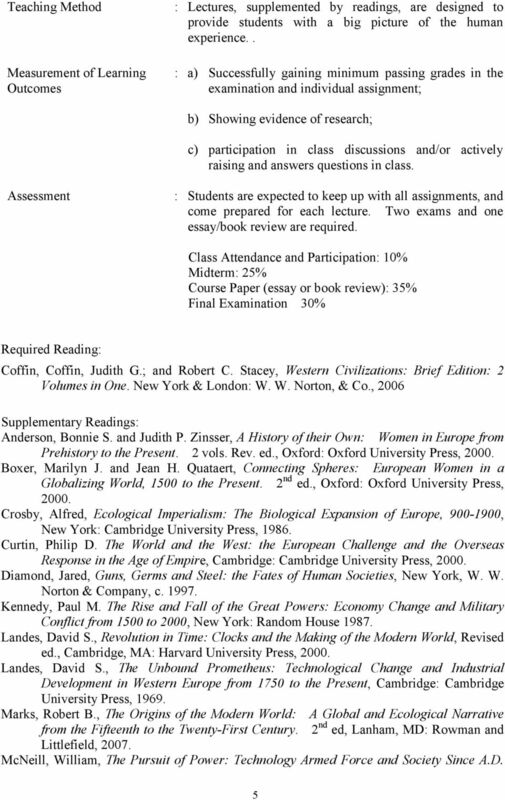 Download ": INTRODUCTION TO EUROPEAN HISTORY"
History. Bachelor of Arts Major in History. Objectives. Degree Offered. Major Offered. Minor Offered. International Studies. Here is the list of history courses with cross listings and how they fit in each of the sections of the History Major. Department of History History 4+1 Program Select students at BYU-Idaho may work towards a graduate degree in Historical Resources at Idaho State University while completing their BA in History at BYU-Idaho. 1. Patterns and effects of interaction among societies and regions: trade, war, diplomacy, and international organizations. World History to the Renaissance traces the development of civilizations around the world from prehistory to the Renaissance. History. Introductory Courses in History. Brautigam, Lian, Luttmer, Murphy, Thornton, M. Vosmeier, S. Vosmeier. 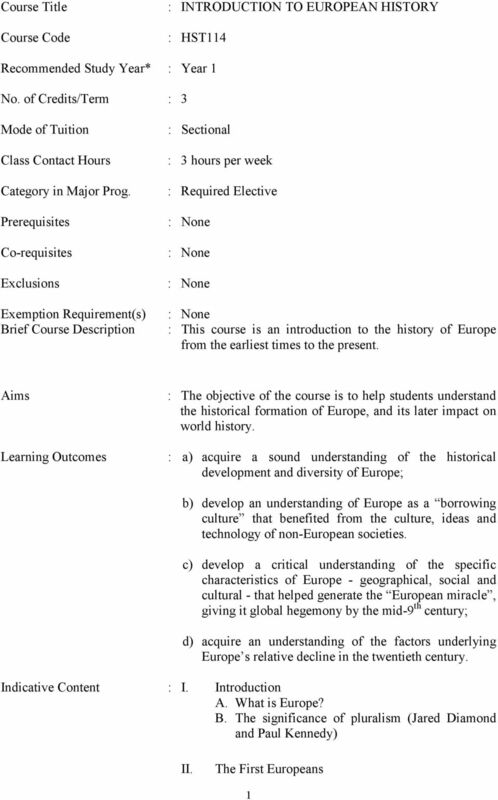 Course: History 109 -Europe to the Age of Revolution (3 Credits-Compulsory) Course duration: Three hours per week for 15 weeks (45 hours) As taught in 2010/2011 session Lecturer: Valdivia, Vivian M.A. Exemplar Question Paper for Higher History The Exemplar Question Paper and have been developed to be used by centres and candidates to prepare for question papers (exams) as part of Higher Course assessment. Ancient Rome Unit Plan Name: Laura Johnson Unit Overview This unit will focus on Ancient Rome, the rise of the Roman Republic, the transition of that republic to an empire, and the fall of that empire. Final Exam Study Guide. 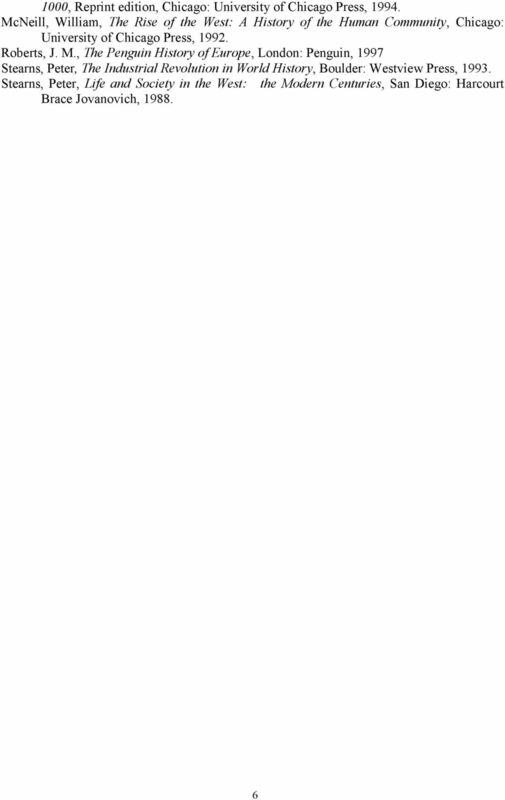 HEY this doesn t look like my normal study guide!!! Office Hours: 10:00-10:50 MW or by appointment. Please call or e-mail me. 211 Normal Hall Phone 768-9438 (O) E-Mail: john.defelice@umpi.